Dahomey is a west African nation between Togo (West) and Nigeria (east). It lies on the Gulf of New Guinea and contains a coastline that turns into forest, swamps, and highlands in the northern parts of the country. the northern parts of the country are covered by the Sahara desert which is not too kind for travel and living conditions. The climate is generally dry, but can be humid because of the swamps collecting water from occasional rain. a vast majority of the land is an open savanna which protects from the high evaporation rate with very hot temperatures. The natural resources that were useful to the French were; Iron ore, phosphates, chromium, clay, marble, and limestone. The soil is naturally rich in many areas in Dahomey, making it a great place for agriculture. The french took advantage of this asset and began producing Palm Oil. To this day, palm oil is one of the most productive industries in Dahomey. Other agricultural products are common like; yams, sweet potatoes, plantains, cocoa-nuts, oranges, limes. Livestock like lamb and cows are uncommon because of the inability for the to graze. As you can see on the map to the right, There wasn't any other way to get to Dahomey other than around northwest Africa. If the Europeans were to travel through the land, they would've faced harsh climate like heat, no water, mountains, deserts, and sandstorms. Going around saved time, lies, and money for the euro. powers. France's tactics for imperialism was based upon assimilation. All of the colonies of France had rich cultures before being imperialized by the European nation. Dahomey, previous to imperialization, spoke the language; Fon. This was one of the many dialects in the country, but the most commonly spoken. Many of their customs were extremely violent, and certainly added to the European's belief that they were savages. One of their customs was an annual festival in October that lasts several weeks. A war prisoner or any prisoner in jail is tied into a basket where it is placed on a high platform and after the chief gives a speech about the afterlife, is pulled down. If the person is still alive, the rest of the tribe will beat them to death. There was a certain heirarchy in the army. Female warriors who were considered a very high rank were called Amazons. These women were hand selected by the chief, general, and any other figure of importance. When they went to battle, they had bows and arrows, spears, shields, and sometimes they weren't armed at all. Women were chosen from the villages for sexual reasons, the women that were "spared" were either sent back to the village for farming and to care for children, or they were enrolled in training for the Amazons. Men in the regular sections of the army wore traditional battle garb. This included painting their face, wearing feathery hats, and skirts that allowed the men to move quickly and efficiently. Weapons were the same as the Amazons, except the men were rarely unarmed. Part of Dahomey religion was worshiping their ancestors. There were many gods that demanded sacrifice, and various decisions had to receive permission from different gods in the afterlife. Festivals that worshiped the king's deceased relatives were one of the most important festivals so their spirits wouldn't disturb the land of the living. Religious practice had different priests and shrines for every different god and cateory of gods (thunder, earth). 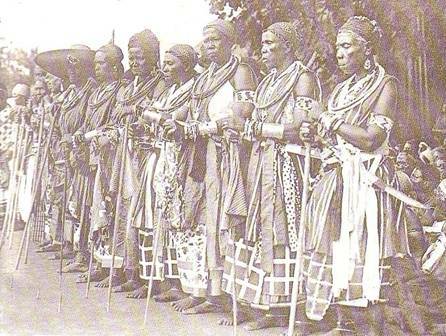 Many women were priests and the chief priests were always a descendant of Dakodonou. The roles of women in the villages and tribes were generally to care for the children, farm, make clothes, or fight with the Amazons. The French utilized Dahomey as an overseas France rather than a plantation with slaves. They built schools, allowing the children to become more educated, churches were built for Roman Catholic missionaries, and eventually, France allowed Dahomey to have its own parliament with French officials. French is the national language, and English is taught in secondary schools. There are about fifty languages and dialects. Even though France educated the villages, this wasn't until the end of their colonial rule. France made the people in this colony endure a new system of government, heavy taxes, forced labor, and severe laws. The work force quickly waned because of the lack of food, the strict living conditions, and the fact that men were constantly working as slaves for the French. Harsh beatings followed after disobeying while working or simply keeping to their culture. Public lashes, execution, and other various punishments were the types of torture the Africans had to go through. The French stripped their culture away from them after three wars. Village shrines and churches were burned, causing anger and resentment towards the French. At the time, the French didn't see what they were doing wrong. The slave trade put an immense impact on the culture. The dispersing of the villagers to other areas in Africa and the world caused the total loss in language, culture, and customs. now, French is the National language instead of Fon. Children were ripped from their families and in some cases lived in the churches to learn from the missionaries so they could spread French culture.